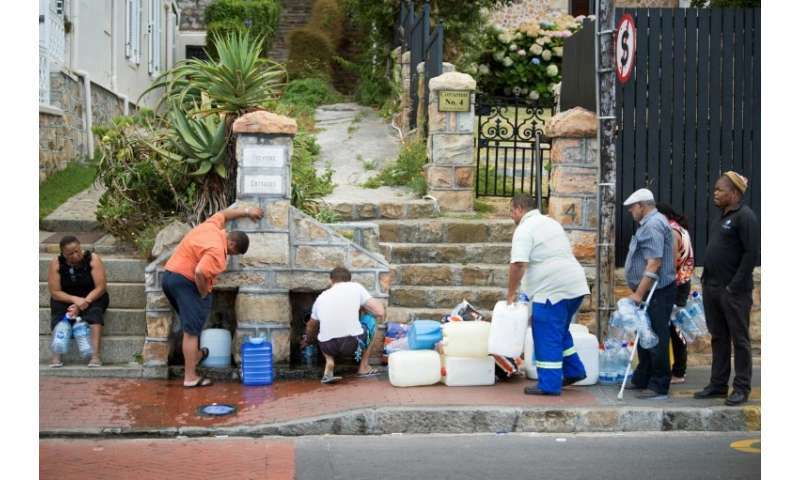 Before man-made climate change kicked in—and well before "Day Zero" in Cape Town, where taps may run dry in early May—the global water crisis was upon us. Freshwater resources were already badly stressed before heat-trapping carbon emissions from fossil fuels began to warm Earth's surface and affect rainfall. In some countries, major rivers—diverted, dammed or over-exploited—no longer reach the sea. Aquifers millennia in the making are being sucked dry. Pollution in many forms is tainting water above ground and below. Cape Town, though, was not especially beset by any of these problems. Indeed, in 2014 the half-dozen reservoirs that served the South African city's four million people brimmed with rainwater. Today, Capetonians are restricted to 50 litres a day (13.2 US gallons)—less than runs down the drain when the average American takes a shower. "Climate change was to have hit us in 2025," she told a local news outlet. "The South Africa Weather Services have told me that their models don't work any more." Since 2015, the World Economic Forum's annual Global Risk Report has consistently ranked "water crises" as among the global threats with the greatest potential impact—above natural disasters, mass migration and cyberattacks. "Across the densely-populated Indo-Gangetic Plain"—home to more than 600 million people in India, Pakistan and Bangladesh—"groundwater is being pumped out at an unsustainable and terrifying rate," said Graham Cogley, a professor emeritus at Trent University in Ontario Canada. As a result, many of the world's regions have passed the threshold that Peter Gleick, president-emeritus of the Pacific Institute and author of "The World's Water," has called "peak water". "Today people live in places where we are effectively using all the available renewable water, or, even worse, living on borrowed time by overpumping non-renewable ground water," he told AFP. 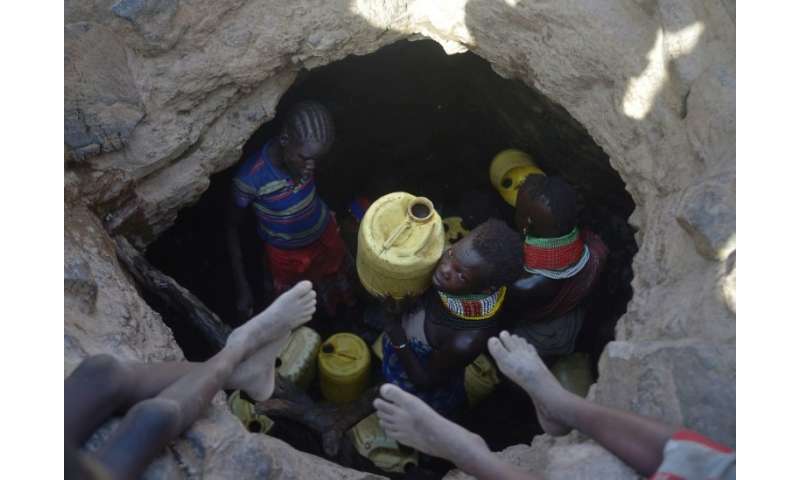 "Half a billion people in the world face severe scarcity all year round," said Arjen Hoekstra, a water management expert at the University of Twente in the Netherlands. "Global warming comes on top of all this," said Hoekstra. 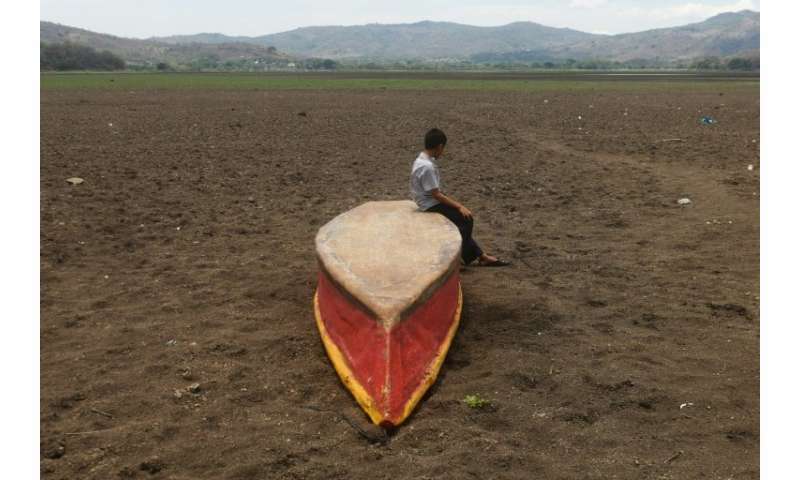 For each degree of global warming, about seven percent of the world's population—half-a-billion people—will have 20 percent less freshwater, the UN's climate science panel has concluded. So far, Earth's surface temperature has risen by one degree Celsius (1.8 degrees Fahrenheit), and the odds of meeting the UN goal of capping the rise at "well under" 2 C lengthen each year. Global warming alters wind and humidity, in turn affecting rainfall patterns. 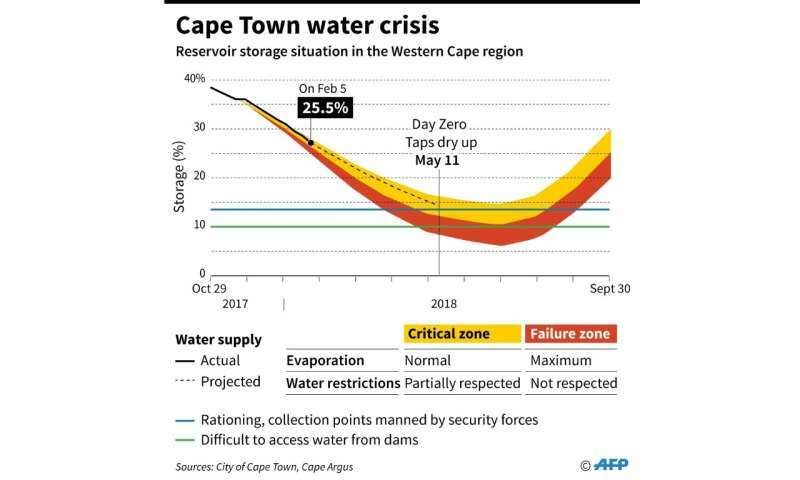 Forecast drawdown from dams in the coming months as Cape Town faces a water crisis. "Climate changes caused by humans are driving changes in our water resources and demands," Gleick told AFP. "As climate change worsens, impacts on water resources will also worsen." California has just emerged from a five-year drought, the worst on record. In 2014-15, Sao Paulo's 12 million souls came close to its own "Day Zero". Beijing, New Delhi, Mexico City and Las Vegas are among other cities that have been facing "huge water supply risks for more than a decade", noted Hoekstra. Currently, only five percent of the continent's agriculture is irrigated, leaving its population highly vulnerable to shifting weather patterns. "Our new normal, at least when it comes to rainfall, is that the chance of dry years increases as we go forward toward the end of the century, and the chance of wet years decreases," said Piotr Wolski, a hydro-climatologist at the University of Cape Town who had compiled data going back more than a century.